Looking to buy a Serbian Cross? Our collection of Serbian jewellery includes a number of styles and sizes of the Serbian cross, Serbian coat of arms (Serbian crest) pendants as well as some ring designs with the Serbian two-headed eagle design. Most of the items are available in 14K yellow or white gold as well as sterling silver. 18K gold is available by special order. We maintain stock of our Serbian crosses and crest pendants while the Serbian rings are made-to-order in your required size. And just like all of the jewellery that we make and sell, our Serbian crosses and jewellery reflect top quality and craftsmanship. We our proud to serve our local GTA community including Hamilton, Burlington, Oakville, Mississauga, Toronto, St. Catharines, and Niagara. Shipping is free within Canada for purchases over $150 and we readily ship to the USA, UK, Australia, Austria, Germany, and some other EU countries. If you try to make a purchase through our online shop and do not see your country as an option please contact us. Follow this link to view our Serbian cross and eagle jewellery. 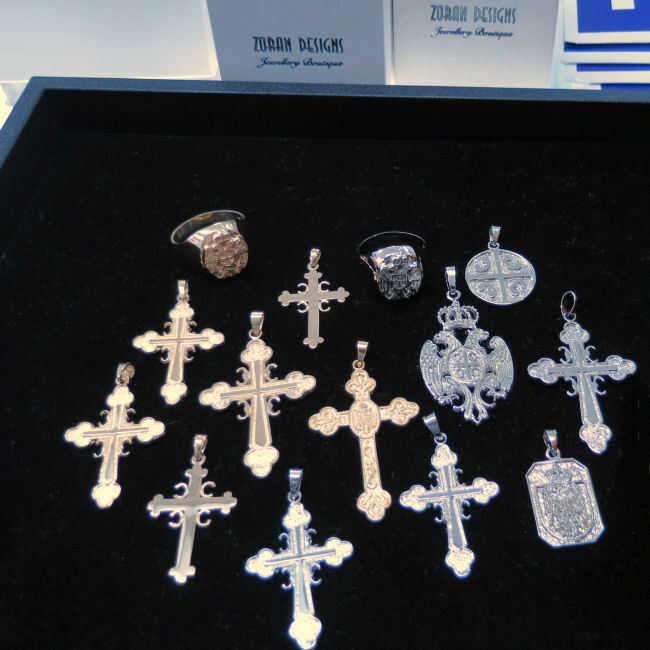 Follow this link to shop Serbian crosses and jewellery online.